Free 2 Year Warranty. *Terms and Conditions apply. The Circulon Ultimum roast and bake set is the perfect choice for those who love versatile ovenware. Crafted from carbon steel ensures the durability of these ovenware pieces and for perfect even baking performance. 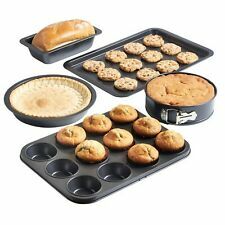 Part of the Tesco range, this 3-piece bakeware set is an essential for any budding baker. 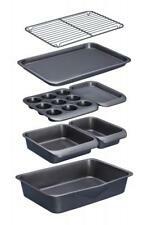 The bakeware set consists of a large oven tray, a deep sandwich tin and a 12-cup bun tray. Made from carbon steel. Large roasting tray size 31 x 21 x 5cm (12¼ x 8¼ x 2"). Square roasting tray size 20 x 20 x 4.5cm (8 x 8 x 1¾"). 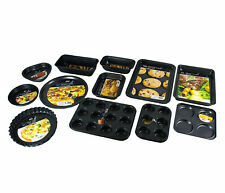 6 cup muffin tray size 28.5 x 17.5 x 3cm (11¼ x 7 x 1¼"). Pizza tray size 30 diam. x D1.5cm (12 x ½"). 11 piece wok set Non-stick 2 x ceramic bowls and 2 x ceramic spoons 2 x chopsticks and 2 x chopstick holders 2 x bamboo placemats Dimensions (W x D x H): 51 x 30 x 10cm . Inspire bakeware is the superior choice for bakers everywhere. CushionSmart™ provides a triple benefit to baking. The cushioned surface enables air to flow around food to create better browning and aids the non-stick performance as low lying areas are protected from utensil abrasion enabling superior food release for longer. Roaster pan L35.5cm x W24.4cm x D4cm. Large Roasting tray L35cm x W25cm x D6cm. 12 Cup Deep Muffin Tray L35.5cm x W26.5cm x D3cm. 5 Piece Baking Trays. BBQ C ake BreadCooling Rack Wire Pan Oven Kitchen Baking Cooking Pan Frying. Making it perfect for roasting foods, dripping fried foods. Spaced cross-wire grids cooling rack, great for cooling cake, bread, cookies etc. Masterclass smart space non-stick carbon steel stackable bakeware set (7 pieces). Lack of storage space can limit the most experienced baker; break free from space confines with this 7-piece stackable bakeware set. 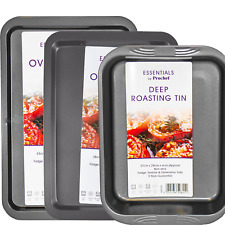 This Joe Wicks 3 piece ovenware starter set includes an oven tray, small tray bake tin and a large traybake tin all made from carbon steel and are PFOA free. Featuring a unique Aerolift non-stick surface, designed for quick and even heat distribution and allows food to release from the surface easier and an even golden baked finish. 1 Cake Baking Mold. Flip buckle design for releasing bottom easily. Made of high quality carbon steel, safe and durable. Material:Carbon steel. Non-stick, easy to clean. Notes: The real color of the item may be slightly different from the pictures shown on website caused by many factors such as brightness of your monitor and light brightness. Non-stick surface ensures the pizza will not be burnt and took it out easily. 1 Carbon Steel Pizza Tray. Professional and new-style that provides air vents on the bottom of the pan. Made of superior carbon steel with wear-resisting, withstand high temperatures, resist deformation characteristics. 1 Cake Baking Mold. Flip buckle design for releasing bottom easily. Notes: The real color of the item may be slightly different from the pictures shown on website caused by many factors such as brightness of your monitor and light brightness. 1 Baking Mold. Ideal for making cake and bread by yourself. Material: Carbon Steel. Color: A s pictures show. Note: The real color of the item may be slightly different from the pictures shown on website caused by many factors such as brightness of your monitor and light brightness. Perfect for creating tarts, quiches, creamy cheese cakes, chocolate cakes, muffins, cupcakes, brownies and other delicious desserts. 4 Set Non-stick mini bakeware tart pan. 4 Set Bakeware. Flexible design, easy mold release and easy to clean. 1 4 Gutter Bake Mold Oven Tray. Material: made of heavy-duty carbon steel with excellent thermal conductivity and even baking properties. Coating: non-stick interior and exterior, easy mold unloading and easy hand-washing. 1 Cake Baking Mold. Flip buckle design for releasing bottom easily. Non-stick, easy to clean. Notes: The real color of the item may be slightly different from the pictures shown on website caused by many factors such as brightness of your monitor and light brightness. This is baking cake mold for cookie, cake baking. Fish shaped mold for making cute cake. 1 Cake Bakery Mold. Made of carbon steel, it is high wear resistant and durable. Material: Carbon Steel. 1 Doughnut mold. Good thermal conductivity, safety and hygiene. Material:Carbon Steel. Single Hole Aperture:7cm (Approx.). Color: Gold(As Pictures Show). Bottom fillet design, non-stick ,beautiful appearance. 4 Set Non-stick mini bakeware tart pan. Perfect for creating tarts, quiches, creamy cheese cakes, chocolate cakes, muffins, cupcakes, brownies and other delicious desserts. 4 Set Bakeware. Flexible design, easy mold release and easy to clean. 1 Doughnut mold. Material:Carbon Steel. Single Hole Aperture:7cm (Approx.). Color: Gold(As Pictures Show). Note: The real color of the item may be slightly different from the pictures shown on website caused by many factors such as brightness of your monitor and light brightness. Cake Bakery Mold Fish Shaped Bread Baking Pan Molds Kitchen Accessory. This is baking cake mold for cookie, cake baking. 1 Cake Bakery Mold. Fish shaped mold for making cute cake. E asy to deformation, good heat transfer effect. Making it perfect for roasting foods, dripping fried foods. Spaced cross-wire grids cooling rack, great for cooling cake, bread, cookies etc. 1 Cooling Rack. Not sticky, easy to wash, Durable & reusable. 4 Set Non-stick mini bakeware tart pan. Perfect for creating tarts, quiches, creamy cheese cakes, chocolate cakes, muffins, cupcakes, brownies and other delicious desserts. 4 Set Bakeware. 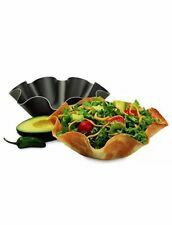 Non-stick, good heat absorption, no use or less grease. 1 4 Gutter Bake Mold Oven Tray. Coating: non-stick interior and exterior, easy mold unloading and easy hand-washing. Color: Silver (As Pictures Show). Material: made of heavy-duty carbon steel with excellent thermal conductivity and even baking properties.